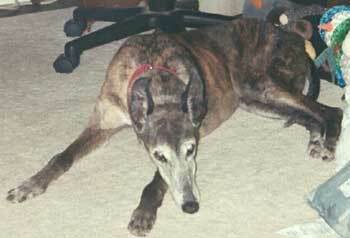 Roxy came to GALT via a Borzoi rescue group. Roxy and her Borzoi buddy, Chance, were surrendered to the group after being kept in a fenced field for the past five years with only a single dog house to share. Their only source of nutrition was an occasional bag of dog food thrown over the fence. 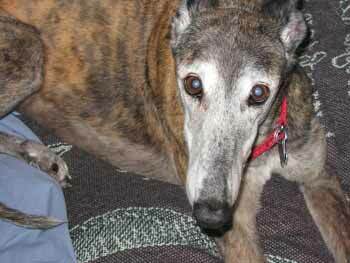 Both dogs were in poor condition when surrendered, and sadly, Chance, the Borzoi, could not be saved. Roxy was a real sweetheart. Her tattoos were difficult to read and she was either 10 or 13 years old. When surrendered, she was covered with fleas and ticks, and tested positive for both heartworms and Babesia. Her teeth were in bad shape, her nails were very long and she was underweight. There were times in the first month she was with us that we wondered if we were doing the right thing for Roxy. After the life she was forced to live, we questioned at times if putting her through this extensive medical treatment was the humane way to treat her. Would she be better off if given a painless journey to the Bridge? Could she withstand the powerful drugs to kill the heartworms? We didn't know the answer, but decided to trust in Dr. Ellis and the wisdom of GALT. I am thrilled to be able to share this update with you. After three months, Roxy has made it through heartworms, Babesia, a horrible UTI and the extraction of five teeth. 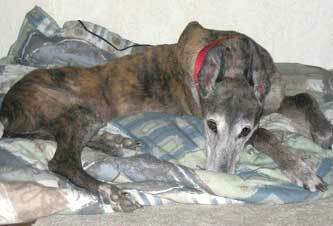 It's been a long road, but I believe that Roxy has shown the true spirit of everything Greyhound. She's now romping like a pup half her age. She has given us so much more than we could ever give her.